Aikido, like most forms of martial arts, can be seen by outsiders as an aggressive way of life. However, this is far from truth. Aikido is a discipline that boosts a number of good aspects of a disciple’s lifestyle and keeps him or her stable, both – mentally and physically. Moreover, the fact that a person burns a lot of calories during a single Aikido workout means that it can prove to be a very effective weight-loss program as well. Aikido has come a long way from its origin as a martial art. It is now widely practiced and learnt by people all over world. People practice Aikido because it provides several health benefits in addition to being a martial art. Aikido has truly gone global and is now accessible to just about anyone who wants to practice it. Although Aikido originated as a form of self-defense and attack, more and more people are becoming aware of the self-control boosting properties of the discipline. The roots of Aikido grow with significant focus on developing the body and mind to work in perfect harmony. Endurance, general physical fitness and conditioning are the hallmarks of this martial art. Stress management is a very important aspect of Aikido because of the fact that being relaxed and calm is central to the ability of learning various techniques. The core principle of Aikido is that ‘Ki’, which is the internal energy, can only flow properly when the body is relaxed. Also known as the ‘art of peace’, Aikido is considered to be an alternative to aggression. Other than the combative properties of the martial art, teachers look to promote various uses of Aikido in a disciples everyday life. Aikido can teach the art of patience and mind control to a person. Long practice of Aikido has the potential to train the mind to focus more. Aikido has helped many in strengthening their memory, managing their stress and making them more calm and determined as a person. One prominent aspect of Aikido when compared to most other forms of martial arts that you are likely to notice is the fact that pushing or extending movements tend to be much more common than pulling or contractive movements. Aikido training does not target specific muscles or muscle groups in order to improve mass, tone and power. Instead, it promotes whole body movement in order to ensure that the body is in synchronization when it needs to perform the art. Calisthenics is a very important aspect of Aikido when it comes to both, cardio and stretching areas of the martial art. Individuals practicing Aikido will experience increased oxygen intake as well as energy levels and a feeling of being significantly rejuvenated. The work out is guaranteed to work up sweat with there being sudden changes in pace of the workout that help further develop the anaerobic aspects of the body. Aikido is a great cardio exercise, meaning that it is great for the health of the heart and blood circulation in general. It is especially useful for people who are older or unable to go to gym or exercise regularly. Aikido greatly helps in weight reduction and in improving fitness of its practitioners. The stretching movements of Aikido help to strengthen the muscles of arms and legs. It is a great way to train the body to become stronger and more flexible. Originally developed as a form of self – defense, Aikido is a very useful tool to possess in the event you find yourself in a vicious, unprovoked attack. Aikido teaches you to use the aggressors own weaknesses against him. It is because of this that Aikido teaches you to remain calm and collected. People that are filled purely with anger or rage during an altercation have their judgment clouded. Aikido practitioners tend to be able to see their opponent’s weakness as a result of their ability to remain calm. Another aspect of Aikido is the fact that there is a lot of focus on reducing the impact that your opponent’s attacks will have on you. Techniques like rolling away and falling properly will help significantly minimize the force of the attack. Self defense is perhaps the oldest and more common use of Aikido. The use of Aikido can help a person to defend himself in the case of an altercation. 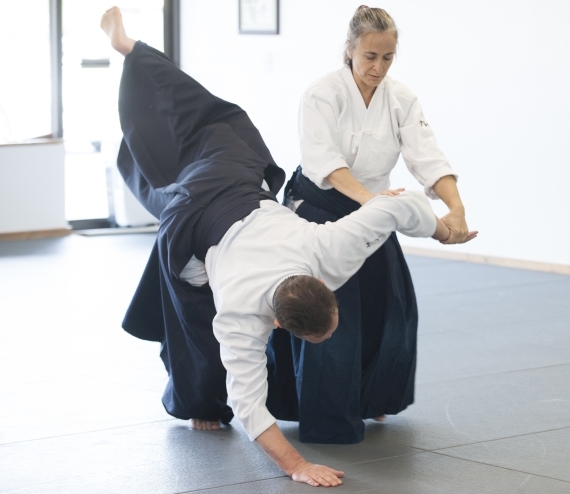 There have been many cases of people successfully using Aikido to defend themselves in attacks. For this very reason, knowledge of Aikido is very useful for any person.